There are a ton of Halloween/Dia de Los Muertos events happening over the next two weeks, so I put a list to help you decide where you want to go. Don’t be afraid to venture off to the other side of town. I purposely listed events scattered around the city and greater Los Angeles that are close to the freeway exits. Check out your local city calendar for free or affordable festivals. I end up learning about resources around the area or upcoming holiday events by attending these festivals. Check out LA Parent for additional event information! You can also filter by topic, so for example if your child is into trains, you will search “trains” and all of the events that include trains will appear. I usually find most of my activities by checking out their monthly magazine that is easily accessible at most schools and libraries. I even spied some at the Columbia Memorial Space Museum. Check out my blog (of course), you can filter at the bottom of the page or click on each folder for specific themes. If there is an event that past and you want to remember it for next year, I just add it to my google calendar for the following year and it will pop up! Columbia Memorial Space Museum, Downey, 105 fwy – Spooky Science Night, Saturday, October 20th The Columbia Memorial Space Museum is a hidden gem (see post from Rocket Fever)! This is an awesome opportunity to see the museum while having fun with science. Children of all ages will enjoy making slime and interacting in the robotics lab. They also have bins of legos for exploration! Discovery Cube LA and OC – Spooky Science, Monsters Academy – This event is all about STEM (science, technology, engineering and math) by allowing kids to experiment with mixing potions along-side a witch, coding and creating sculptures in a Shock Lab, become a web designer with a spider, learn about the human skeleton, and help a vampire with his reflection. Talk about an awesome theme-based learning experience! Online tickets are $12.95 per person, but AAA offers a discount. And as a reminder, your ticket gives you access to all of the exhibits so this is a good way to maximize your trip if you have never been to Discovery Cube before. I like to visit new places when they have special holiday events because I feel like it is more bang for your buck! El Dorado Train and Pumpkin Patch (Long Beach, 605 fwy) – The El Dorado Train is going through a makeover! Visit their updated station as they tell the story of the Jack O’ Latern! Pick up a pumpkin in their new pumpkin patch. Train ride is $4, and pumpkin prices vary. They are only opened on the weekends from 10am-5pm. Fowler Museum (UCLA, off the 405 fwy) – Día de los Muertos (Day of the Dead) celebration on Sunday, October 21st from 1-4pm. There will be dancing, music and storytelling by LA-based group Xipe Totec Danzantes Aztecas. Participants can create tissue paper marigolds. I am all about exposing kids at a young age to college life so participating in Dia do los Muertos at UCLA caught my attention as an amazing opportunity for our family and children. Another plus is that admission is free! Griffith Park Fall Festival, FREE Admission Nov 4th from noon-4pm, (where the 134 and 5 fwy meet) Celebrate fall in L.A.’s largest urban park! Enjoy live music, local craft beers curated by the Los Angeles County Brewers Guild and a Kids Zone featuring a climbing wall, bounce houses, games and more. The Griffith Park Harvest Festival is fun for the whole family! Festival is held below the merry-go-round (4730 Crystal Springs Dr, Los Angeles, CA 90027) Co-hosted by the Los Angeles Parks Foundation and City of Los Angeles Department of Recreation and Parks. All proceeds benefit L.A. City parks. Ghost Train (Griffith Park, where the 134 and 5 fwy meet) – I’ve been waiting for this Ghost train since we rode this train back in May! It is a miniature train that you actually sit on and ride out in the open so there is a minimum height requirement of 36 inches. The train route has been converted into a ghost town which is supposed to be an amazing production. If you are coming with your children, I’d suggest getting your tickets ahead of time because they will have three different lines (pre-ordered express, pre-ordered, and stand by) that will vary by waiting time. I’ve heard it is worth it! Grand Park LA (110 and 101 fwy meet) – Noche de Ofrenda and Día de los Muertos – Oct 27-Nov 4th, FREE! There will be 40+ altars and art installations spread out throughout the park. There will be free lunchtime altar tours during the week. On Sat, Nov. 3rd, there will be family-friendly activities such as altar-making workshops. If you want to maximize your visit, the Last Bookstore, Broad Museum and the Los Angeles Public Library are nearby to visit! Los Angeles Public Library – A couple of the branches are offering a free movie screening of Tim Burton’s The Nightmare before Christmas! Check out this list for specific branches. If your local library is a city library, reach out to find out what type of holiday events they are offering. I am all about maximizing my trip, so a movie screening followed by checking out some Halloween books is down my alley! Night of the Jack (Calabasas, 101 fwy) Is a 45 min- 1 hour trail of hand carved pumpkins shaped into different types of animal, people, and structures. Ticket fees are Adults- $25, Children- $20 (4yrs-12yrs) 3 and under are FREE. The event starts at 6pm so you can also take advantage of local activities. If you are making a trek, the Calabasas Pumpkin Festival is happening the weekend of Oct 20th so you can attend both! Santa Ana – Boo at the Zoo (Santa Ana, 5 fwy)- The event will take place from 5:30 PM to 8 PM on Saturday, October 20; Sunday, October 21; Saturday, October 27; and Sunday, October 28. Boo at the Zoo is one of Orange County’s longest-running Halloween events, providing a fun, safe, and family-friendly event for trick-or-treaters and children of all ages who love to wear costumes and embrace the Halloween spirit! Guests will have the opportunity to explore 10 prize stations on our Trick-or-Treat Trail, enjoy a variety of Halloween-themed games and activities – including storytelling and sing-alongs, and visit nocturnal animals. For an additional fee you can ride the “Boofari” Express train, carrousel and ferris wheel. This will be their second year proudly supporting the OC Teal Pumpkin Project, ensuring kids with food allergies are presented with friendly treats and takeaways! There will also be food available for sale that includes hot dogs, hamburgers, chips and soda (cash only). 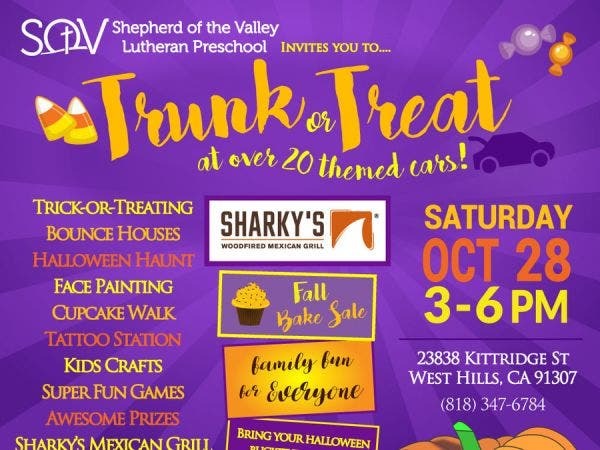 Trunk or Treat at St. Peter’s by the Sea (PCH)- Sunday, Oct 28th starting at 4pm, families can come in costume and can “trunk or treat” for candy at a church parking lot. There will also be a chili cook-off. There are tons of Trunk or Treats scattered across the city. I love how creative car owners can get by decorating cars. For some reason my toddlers are amazed by it, maybe because they are also getting candy. If you have never experience a Trunk or Treat, this year might be the year! Here is another one near me! We attended this one last year and it was seriously one of the best Halloween events. There was so much detail, so their bake sale isn’t just a bake sale. I mean there will be a spooky witch brew, or some sort of fancy cupcake. Previous Tanaka Farms – Sanrio, Inc.